How long have you been with the Pasadena Pacers? Three years. Why do you run? I have the best running partner who taught me running was awesome. Favorite post run snack/meal? Beer and Mexican food. Running mantra: Running keeps the crazy train out of the station. What do you do for fun? Cheer on the Minnesota Vikings! Do you have a secret talent? I wish! Anything else you’d like your fellow Pacers to know? 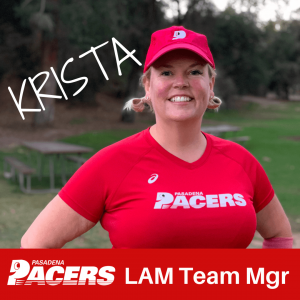 No matter why you’re running, I think it’s awesome you’re a part of the Pasadena Pacers! Everyone joined for different reasons, but why you stay may be for something else. I learned I love the community that the Pacers Nation has.